To that end, in 1850 the United States and Great Britain negotiated the Clayton-Bulwer Treaty to rein in rivalry over a proposed canal through the Central American Republic of Nicaragua. The Anglo-American canal, however, never went beyond the planning stages. French attempts to build a canal through Panama (province of Colombia) advanced further. Led by Ferdinand de Lesseps—the builder of the Suez Canal in Egypt—the French began excavating in 1880. Malaria, yellow fever, and other tropical diseases conspired against the de Lesseps campaign and after 9 years and a loss of approximately 20,000 lives, the French attempt went bankrupt. In spite of such setbacks, American interest in a canal continued unabated. The Hay-Pauncefote Treaty of 1901 abrogated the earlier Clayton-Bulwer Treaty and licensed the United States to build and manage its own canal. 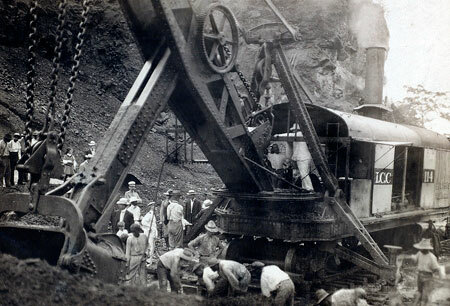 Following heated debate over the location of the proposed canal, on June 19, 1902, the U.S. Senate voted in favor of building the canal through Panama. Within 6 months, Secretary of State John Hay signed a treaty with Colombian Foreign Minister Tomás Herrán to build the new canal. The financial terms were unacceptable to Colombia’s congress, and it rejected the offer. President Roosevelt responded by dispatching U.S. warships to Panama City (on the Pacific) and Colón (on the Atlantic) in support of Panamanian independence. Colombian troops were unable to negotiate the jungles of the Darien Strait and Panama declared independence on November 3, 1903. The newly declared Republic of Panama immediately named Philippe Bunau-Varilla (a French engineer who had been involved in the earlier de Lesseps canal attempt) as Envoy Extraordinary and Minister Plenipotentiary. In his new role, Bunau-Varilla negotiated the Hay-Bunau-Varilla Treaty of 1903, which provided the United States with a 10-mile wide strip of land for the canal, a one-time $10 million payment to Panama, and an annual annuity of $250,000. The United States also agreed to guarantee the independence of Panama. Completed in 1914, the Panama Canal symbolized U.S. technological prowess and economic power. Although U.S. control of the canal eventually became an irritant to U.S.-Panamanian relations, at the time it was heralded as a major foreign policy achievement.